Beautiful nature and exciting things to do right on your doorstep. Go sea fishing, take in the spectacular landscape and catch a true glimpse of Sami life. Take the summit trip to Salenfjellet mountain for a view you will never forget. Our hotel offers 85 rooms all with a view of either the city or the sea. If you are planning a meeting, conference or event we can provide venues for up to 250 participants. A hearty breakfast is served in the restaurant that even offers à la carte dinner and the bar is ideal for enjoying drinks. We also have a modern hotel gym where you can keep in shape during your stay. As a hotel guest you always have free WiFi in your room and public areas. Scandic Hammerfest is centrally located in the world’s northernmost town. With beautiful nature and activities right outside the door, our hotel is an excellent base from which to explore this exciting destination. From here you can wander along “Gammelveien”, the only road into town in the old times. Take “Sikksakkveien” up to the Salenfjellet mountain, which offers spectacular views. The hotel is located within walking distance of the ferry that crosses to the neighbouring islands Soroy and Seiland, which are famous for their beautiful natural landscapes. Go sea fishing, take a summit trip to Storfjellet mountain and get a true glimpse of Sami life. Scandic Hammerfest offers the possibility to experience many exciting attractions and beautiful natural surroundings with your family or colleagues. The harbour and bus station are within walking distance of the hotel and Hammerfest airport is just a short drive away. 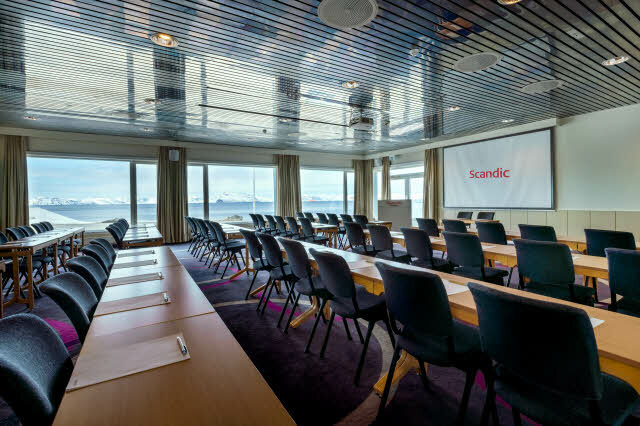 At Scandic Hammerfest we can organise meetings and conferences for up to 250 participants. All our meeting rooms have natural daylight, and three of them have a direct view of the fjord!